Millions of consumers have followed the Tech Podcasts Network (TPN) coverage of the Consumer Electronics Show throughout the past five years – in part because of its unique presentation style. TPN coverage of CES provides the latest technology information, featuring real tech personalities in the thick of the event, jostling among the crowds, seeking extraordinary, innovative and unusual products. Consumers eager to see what new tech toys and trends set the pace in 2011 will follow TPN’s coverage of CES, returning for authentic insight into products and tech trends that they have come to trust and depend upon since 2005. Video Track Record: The past four years, TPN has produced more than 600 CES on-floor video interviews, reaching an average of 12 million unique viewers each year. 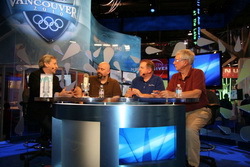 Live Streaming Success in 2010: In 2010 we were invited by NBC Universal to produce two live streaming events on their main stage. During those one-hour events we interviewed 10 separate companies and had a live active audience of more than 10,000 viewers. See the recorded coverage here http://bit.ly/nbcuni1 , http://bit.ly/nbcunib. What’s New for CES 2011: Tech Podcast Network will have a live broadcast booth in the heart of the exhibit hall, where we will stream more than 35 hours of coverage of the show. Set-Top Box Media Distribution: Since early 2010, Techpodcasts.com has been listed as a top tier channel on the Roku set-top box. We have similar placement on Boxee’s directory and are creating apps for other platforms such as VuDu and Samsung. Next up? Google TV. Exposure Potential: In January 2011 TPN will launch a dedicated TPN-CES channel on each platform (Roku, Boxee and others) where we will release CES 2011 coverage segments during and after the show, guaranteeing exposure for vendors and sponsors for a full year. Even if your company is not exhibiting at CES 2011: This is an opportunity to reach tech savvy consumers throughout the course of the show and ensure web / media distribution of the content with your message following the show. Added Value: Vendors we interview at CES also help by highlighting the coverage of their segments. Since your sponsor message is embedded in the video, you are guaranteed brand exposure on a variety of corporate sites. Coverage from the 2010 event is still seeing strong view activity nine months later because of the product tagging and SEO strategy we employ on each interview release. The Show Coverage: TPN coverage includes five video elements – Live Stream, “Pick of the Day,” product interviews and a high interest back channel. Update: We will also be doing several segments from the NBC Universal Live Stage again in 2011 on top of our live broadcast booth content. Live Stream: TPN will stream live from our broadcast booth, during open show hours interviewing four to six high profile guests each hour, simulcast on multiple TPN partner sites as well as rebroadcast after hours. All live show coverage will be broken into segments and post published on the web, and available as podcasts. TPN Pick of the Day: (TPOD) Each day, we produce a single 10-15 minute video covering five to seven product or demo highlights. Only the most interesting products of the day are featured. The four 2010 Pick-of-the Day TPOD videos averaged 155,000 views each within 72 hours of release. Product Videos: (PV) TPN show hosts will also produce on average 120 product interviews from the show floor and at evening “Press Only” events. The product videos are then professionally post-produced and released after the show. Backchannel Videos: (BC) Backchannel videos show the process we go through to plan and execute during the event. They keep viewers and listeners emotionally engaged in the struggle to cover such a massive event. Backchannel videos highlight the hard work, boredom, excitement, challenge, aggravation, frustration, and exhaustion faced by the team. In 2010 we released nearly 40 hours of unedited back channel content. What it isn’t: This is not an opportunity for a single spot appearance, companies never pay for access to our audiences. All interviews with companies that are covered at the show are independently determined and at the sole discretion of the show hosts. What it is: This is an opportunity for your company to have your product or service message integrated into our coverage as if you were buying standard radio, broadcast, or new media ad spot. All Sponsor messages will be clearly designated in line with mandated FCC disclosure rules. It’s simple: You pay a flat rate and get your company’s brand and message integrated into TPN live and recorded content. We agree on message length, talking points and product features to be emphasized throughout the entire week. Banners, text links with hyperlinks and social media exposure are always included in all sponsorship levels. Distribution: All media, whether streamed live or recorded from show floor, will be published on the web with SEO strategies, and made available for podcast download. All media will also be published into our set-top-box channels on Roku and Boxee, and available for embed on your web site and product pages. Live Stream: Your company will receive one or two mentions per hour during our live streaming event, either a live host-read spot or a 30-45 second canned commercial. There are four (4) total sponsorship slots available for the live stream with one being designated the bandwidth sponsor. Product Video: Your company will receive one, 15-30 second ad spot in all of our 2011 CES Show Floor Product Video Interviews. Estimated Exposures will be 12-15 million uniques. Back Channel: Your company will be the exclusive sponsor of the 2011 back channel coverage at the 2011 Consumer Electronics Show. With an estimated 30-40 hours of back channel Coverage. For more details, contract discussion or questions contact Todd Cochrane @ 808-741-4923 or [email protected]. Contact us today!